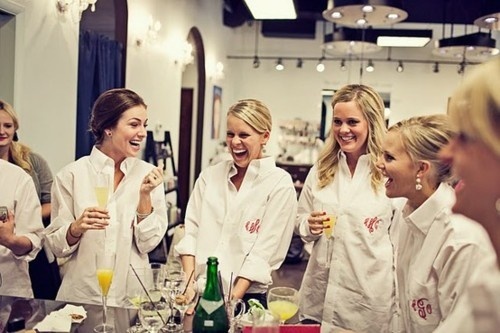 A bridesmaid can't wait to plan the bride's bachelorette party. We've joked with our girlfriends for years about what we would do for each other, but the time is finally here and you've ran out of ideas. Finding something that fits your personalities can be a challenge so here are 5 bachelorette party ideas in the Omaha/Lincoln area! 1. Visit downtown in the Old Market/Haymarket - Have dinner with your favorite girls before grabbing a few drinks. Maybe even see a concert at your local bar! It doesn't matter where you're at, it's who you are with and remember that your girls have your back! 2. The Corky Canvas - Bring back your favorite childhood memories of arts & crafts and stop at The Corky Canvas to create a few masterpieces. If you're feeling a little more adventurous, make a game out of it or bring your favorite wine along. 3. Escape Room - See how close you and your girls really are. Can you work together to escape a room full of puzzles or do you just think you know each other well enough? In both Omaha and Lincoln, this is something for our more competitive wedding parties. 4. Cooking Lessons - Instead of going out for the night, bring in a chef that can teach you how to make the perfect honeymoon meal. Whether we like to admit it or not, not all of us are the best chefs, so practice up on your skills before they are really put to the test. Cooking lessons can be a great way to spend time with your girls and eat some fantastic food while doing so! 5. Wine Tasting - Kick back and relax by spending a day at a nearby vineyard. Drink a little wine and enjoy your time with your girls. It doesn't matter if you are there to learn or just there to have a few drinks, this is a great way to see a part of Nebraska you've never seen before. Plus, who doesn't like to drink wine? !